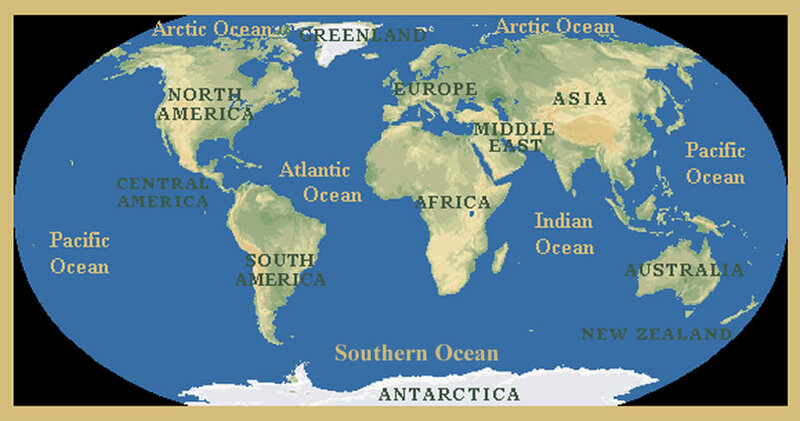 The seven continents are North America, South America, Europe, Asia, Africa, Australia, and Antarctica. The five oceans are the Pacific Ocean, the Atlantic Ocean, the Indian Ocean, the Arctic Ocean and the Southern Ocean. The Southern Ocean surrounds Antarctica. Use the map below to identify and locate the continents and oceans of the world. Use the map above to complete the questions below. 1. What ocean lies south of Asia? 2. What continent borders the Indian Ocean and the Pacific Ocean on its north shore? 3. What continent lies directly west of Europe? 5. What ocean lies between South America and Africa? 6. What ocean lies near the north pole? 7. What continent borders the Pacific Ocean on its eastern coast and the Arctic Ocean on its northern coast? 8. What continent may have once been a part of Africa's west coast? 9. What continent is directly south of Europe? 10. What continent appears to be a part of Asia? 11. What ocean lies off the west coast of North America? 12. What ocean surrounds Antarctica?